Have you ever heard that adding plants at work can boost productivity by 15%? Green plants have indeed a remarkable ability to remove noxious substances from indoor air while replenishing oxygen, and there is experimental evidence from NASA that proves this. A green wall is basically a wall made from plants, which includes space for soil and an irrigation system. Other than improving indoor air quality (IAQ), green walls have decorative purposes and make building interiors more appealing, boosting the health and mood of occupants. A passive green wall relies on natural convection to purify air. An active green wall uses forced airflow to enhance the purifying effect. 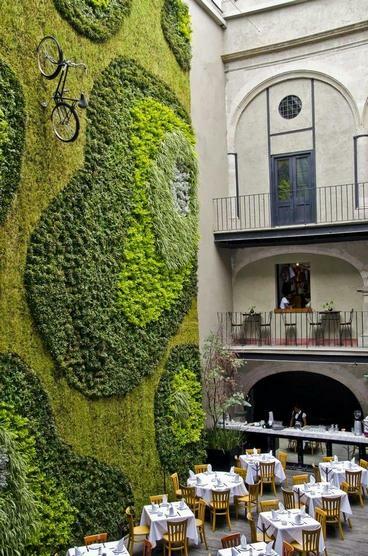 Green walls should not be confused with green facades: a green wall has growth media supported by the wall; while a green facade only has soil at the bottom, allowing plants to grow and cover the wall. If a building owner is applying for LEED certification, the use of green walls can be of great help, allowing the accumulation of up to 36 credits. The LEED certification is highly sought after by companies throughout the world, since it provides proof of energy conservation, water conservation and environmental stewardship. Green walls can be of great help for LEED certification, offering up to 36 credits. Green walls are often installed with automatic irrigation, so their maintenance needs are minimal. They only involve two ongoing responsibilities: removing dead leaves and adding nutrients to the soil every few months. If the irrigation system is connected to a water fixture, it can operate continuously without intervention; when there is no water line near the green wall, a tank may be used, but it must be refilled every occasionally. As previously stated, an active green wall uses mechanical ventilation to establish a forced airflow. 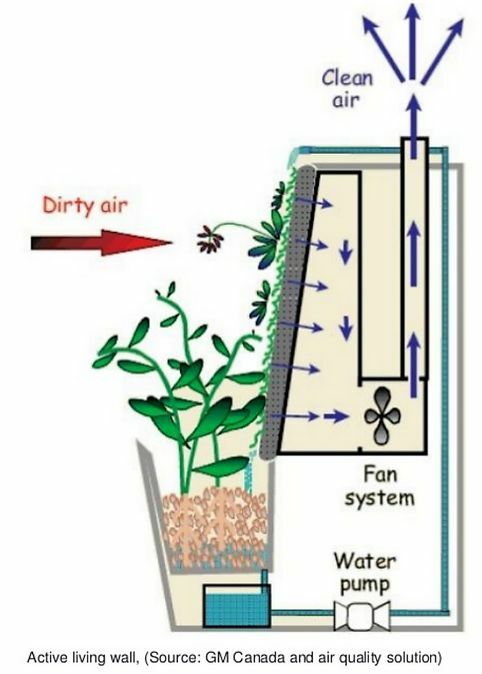 A ventilation system captures polluted indoor air and delivers it to the green wall. The air is injected into the soil around each individual plant, allowing bacteria to capture and metabolize pollutants. Soil bacteria have a remarkable ability to absorb and metabolize nitrogen dioxide, turning it into compounds that fertilize the soil and are then absorbed by the plant. The air then flows out of the pot and around the leaves of plants, allowing further absorption of pollutants and replenishing oxygen. Active green walls are generally more expensive and their installation is more complex, but their air-filtering effect per unit area is increased. 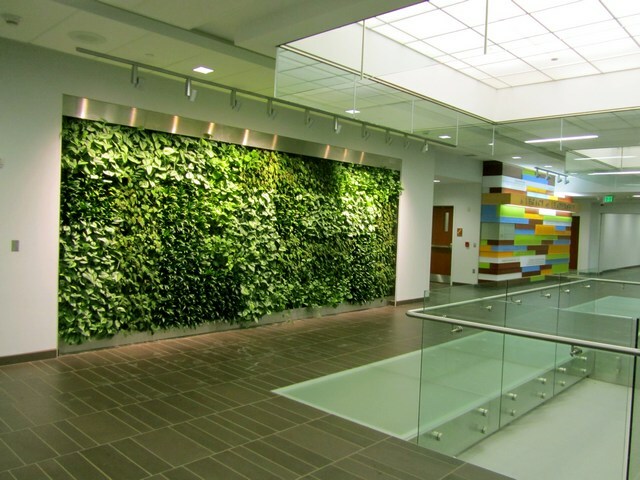 According to IFSA (International Frequency Sensor Association), an active green wall with built-in controls can absorb particulate matter 8 times more effectively, and VOCs such as formaldehyde are absorbed 3 times more effectively. The study also determined that green walls remove pollutants more effectively when plants are exposed to light, and there is a slight decrease in effectiveness when indoor spaces are dark. Passive green walls rely on natural airflow to purity indoor air, making them less expensive and easier to install, at the cost of reduced performance with respect to active green walls. They improve indoor air quality as well, but require a larger area to achieve the same effect as active green walls. Loose medium: The simplest way to build a green wall is using soil on shelves or containers that are supported by the wall. This main disadvantage of this method is that it takes up plenty of space. In locations with seismic activity, extra supports may be necessary to prevent the containers or plants from falling off. Mat medium: An alternative to shelves is using fiber or felt mats with trapped soil. This method uses up little space but lacks the structural integrity of shelves: therefore, it is recommended only for small and lightweight plants, and in locations without significant seismic activity. Mats also have a limited water-holding capacity, which means they must be irrigated frequently. Sheet medium: Polymer sheets with open cells can be used as an alternative to mats, improving the structural integrity and water-holding capacity. Another advantage of polymer sheets is that they are non-biodegradable, which gives them a service life of over 20 years; fiber or melt mats typically last for only a few years before needing a replacement, and many plants are killed accidentally during the replacement process. Structural medium: There are also green walls that use blocks or other structural elements with the space for soil and plants. This provides a rigid support and plenty of space for roots to grow, but it is also the approach that tends to take up the most space, and the most difficult to implement in an existing building. No growth media is better that the rest, as it all depends on the application. For example, structural media can be a great choice in new constructions, resulting in a project with built-in green walls. The other alternatives are better suited for existing constructions – sheets are a great choice for small plants, and shelves can be used if the plants and their roots are too large for sheets. Artificial filters can remove harmful compounds in the air, but are unable to replenish the oxygen content. The only way to replenish indoor oxygen without plants is using mechanical ventilation to draw in outdoor air, while expelling indoor air. Plants’ ability to replenish oxygen is the main reason why NASA researched their effect on IAQ – in outer space there is no such thing as outdoor air! Filters capture pollutants but don’t eliminate them: they must be cleaned frequently, and if the cleaning process is carried out carelessly, a significant portion of the captured pollutants may be released at once! On the other hand, plants break down noxious substances into harmless compounds, and in some cases they assimilate them. Plants can provide air humidification, which is a great benefit in dry climates. Artificial air humidification often comes with a high energy cost, but plants can improve relative humidity by up to 5% for free. Many plants emit pleasant fragrances, allowing you to avoid artificial aromatizers, which typically contain volatile organic compounds (VOCs). Air filters are useless unless air is blown through them. On the other hand, green walls can purify the air passively, with no need to spend energy on fans – they perform better with a forced airflow, but it is not mandatory. The noise produced by green walls is minimal or zero, while conventional air filtration systems can be quite noisy. 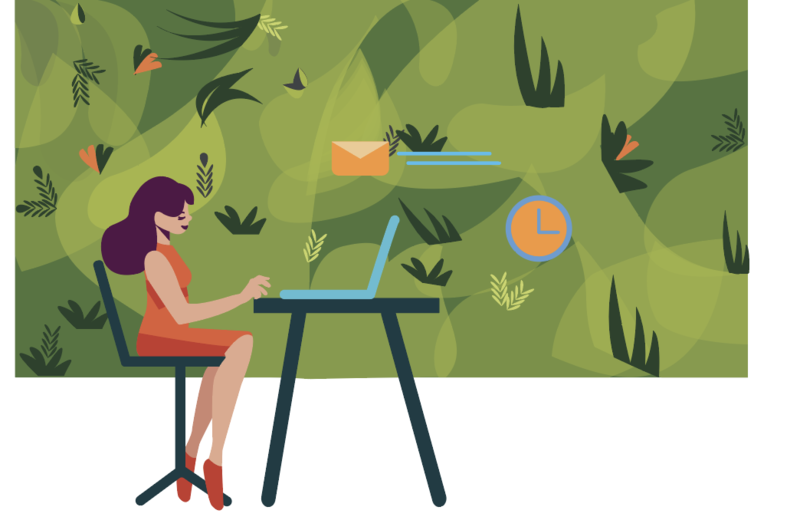 In addition to the benefits above, which are measurable, green walls come with subjective benefits: decorative potential and a mood boost for occupants. The extra motivation can result in increased productivity in office buildings, and plants can also help attract customers in retail applications, or retain employees thus reducing turnover. By themselves, green walls can deliver 36 of the 40 points required for a building to be LEED Certified. They can also provide a significant boost for property owners striving for the higher certification levels: LEED Silver (50-59 points), LEED Gold (60-79 points) and LEED Platinum (80 points or above). To maximize the credits achieved with green walls, hiring a LEED Accredited Professional is highly recommended. In many cases, they key to earn more LEED points is presenting a compelling argument and hard evidence of the energy and environmental benefits achieved. Two identical LEED projects can get different scores depending on how the report is presented. When using green walls, there are several important factors to take into account. Plants are highly beneficial for IAQ, but careless implementation can have various negative consequences. Keep in mind that plants increase indoor air humidity. If a building is experiencing humidity problems before deploying green walls, these can be expected to increase! Many people suffer from pollen allergies, so the best plants for indoor use are those that don’t release it. Insects like to live in plants: their presence is diminished indoors, but they must be kept under watch nevertheless. Insect control is especially important in semi-open spaces where indoor plants are used. 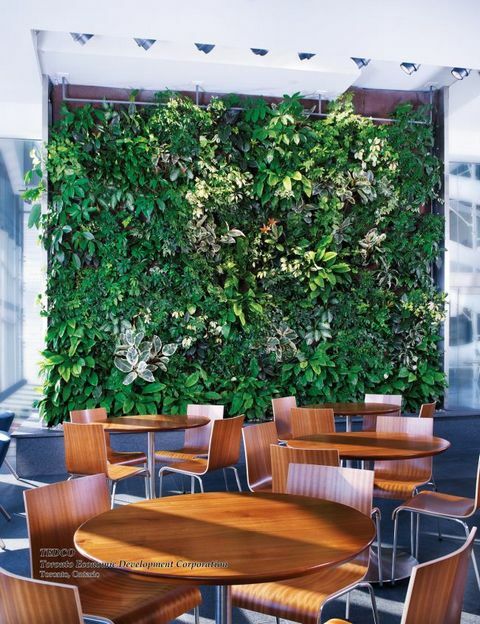 Do you have or plan to have green walls in your building? Let us know how you feel about it in the comments below. depending on the improvement, which itself depends on the air quality before getting plants and the number/type of plants introduced, you would see it on your Foobot graphs clearly or not.